Dangerous Waters is now available!! The Dangerous Waters jacket is set and the book is off to the printers (9/5 release date). Can't wait to get my hands on the first copy! Dangerous Waters will be available on September 5th!! 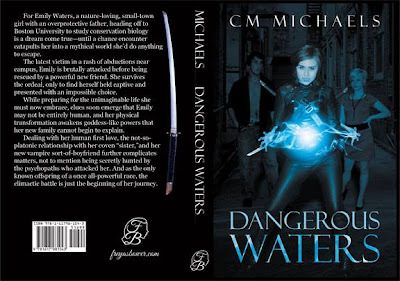 Dangerous Waters will be available in eBook and paperback on September 5th! Dangerous Waters book trailer premiere!! The Dangerous Waters book trailer premiere has finally arrived!! Please check it out and spread the word to all of your friends and family! I'm working on setting up a Michigan book signing tour from 9/21 - 9/28 with planned stops in Lansing, Novi, Mt. Pleasant, Saginaw and Traverse City! The trailer will be playing at theaters in Canton, Traverse City, Lansing and Louisville from 11/1 - 11/29. Check back for details on each of the tour stops! 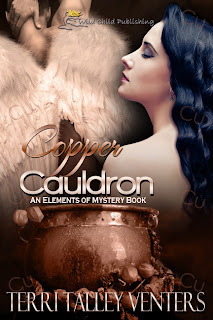 Terry was kind enough to share another of her wonderful elemental short stories! Check it out! Priscilla squealed with excitement as she danced in circles, delighted to receive the coveted Valentines’ Day party invitation hosted by her friends, twins Jeb and Shelby. Priscilla, along with everyone else fortunate enough to attend, looked forward this annual party of the season. The tradition started several years ago when Jeb and Shelby’s parents wanted society to mingle with their teenage children on Valentines’ Day in hopes to find good matches for their twins amongst the children of their wealthy friends. Everyone anticipated an engagement between Priscilla and Jeb. In fact Priscilla let Jeb kiss her on the beach at last year’s Valentines’ Day party. Although she’d hoped for a proposal last year, she understood the delay since he and his twin sister, along with their parents, departed for Europe a few days after last year’s party. Priscilla worried why he never wrote to her during this last year. She feared Jeb’s parents would try to marry him off to a lady of nobility during their Grand Tour. She read the social pages everyday and felt thankful to hear no news of him. Her heart would break if she learned Jeb got engaged to another woman. It didn’t surprise her to not see him since last year. The McAlister’s lived in Philadelphia, while Priscilla and her family lived in New York. But like most wealthy families, they spent their winters in Florida. They took the Florida East Coast railroad to St. Augustine, Florida and stayed in the luxurious Ponce De Leon Hotel. Since the beaches in Florida were so beautiful, many wealthy families built their winter homes here including the McAlister family. Valentines’ Day finally arrived and Priscilla arrived at the McAlister’s enormous beach home located on the inlet leading into St. Augustine. Her full-length, red satin gown would normally appear inappropriate on an unmarried woman, but her mother acquiesced and allowed Priscilla to borrow hers for this special evening. Priscilla walked up the steps of the party and felt breathless at the sight of everyone wearing their finery--the women in beautiful gowns and jewels and the men in coats with tails and top hats. She entered the beautiful home and fantasized about her future with Jeb. She pictured herself wearing the latest fashions from Paris, adorned with diamonds, emeralds, and sapphires, depending on which gown she chose. But the best part about her fantasy life was the title of Mrs. Jeb McAlister. She entered the enormous ballroom and immediately searched for Jeb. She took the glass of champagne handed to her by a servant, but ignored the scrumptious buffet meticulously laid out in the formal dinning room of the mansion. She knew eating like a field hand repulsed most gentlemen, along with her waistline. She saw many of her friends which delighted her, but she saw no sign of any of the McAlister’s. “Priscilla, darling, how wonderful to see you. Have you met Matthew Oxford of Boston?” Madeline asked, kissing her cheeks to greet her friend since childhood. “Of course, I remember Mr. Oxford. How do you do?” Priscilla asked. She raised her gloved-hand and allowed him to kiss the silken fabric protecting her delicate fingers. “How do you do, Priscilla. How wonderful to see you again. I was just telling Madeline how sorry I was to hear about her husband who went down on the Titanic last April,” Matthew said. “I’m so sorry for your loss, Madeline. And how unfortunate I must again compete with the beautiful Madeline Astor. How can I possibly land a fine husband when every eye is on you tonight,” Priscilla said. “Thank you, Priscilla. But I’m afraid you outshine me in your beautiful red gown,” Madeline said. “Madeline and I were just discussing how the tragedy of so many lost souls on the Titanic increased my business last year,” Matthew said. “How interesting. It’s good to hear something positive derived from such a tragedy,” Priscilla said. She tried to hide her shock to hear a man discussing business in front of ladies. But his breach of etiquette reminded her of Matthew’s “nouveau riche” status. “Mr. Oxford makes headstones for a living and his father owns a granite quarry,” Madeline said, catching Priscilla up on the conversation while sharing her misery of the dreadful tale. “You see, tombstones are made from granite, although granite is composed 65% of silicon dioxide,” Matthew said. Priscilla forced her eyes not to close with boredom from this dreadful conversation. She needed to find Jeb without appearing rude. “Sounds fascinating, Matthew. Although I don’t care to ever see another tombstone again, I’d love to hear more about the tombstone making business. But if you’ll excuse me, I’d like to search for our host, young Mr. McAlister,” Priscilla said. Priscilla walked out to the beach and stood in the same spot where Jeb had kissed her one year ago tonight. She missed him terribly and felt disappointed she hadn’t seen him at his own party. She understood his duties as a host, but she thought it rather odd that no one saw either Jeb or Shelby at tonight’s party. In fact, no one saw or heard from the McAlister’s since last year’s party. Priscilla couldn’t believe her eyes at the sight before her. As her vision watched the circling lights of the lighthouse across the bay, she saw a figure standing on the rocks. He looked like Jeb. She blinked her eyes and thought her prayers were finally answered. Her heart knew the image she craved to see again belonged to her beloved, Jeb McAlister. He looked at her without saying a word. He started walking towards the house and Priscilla followed him. Although it thrilled her to see him again, it concerned her when he didn’t come to her now. After an entire year apart, she felt disappointed at his lack of response. She’d expected Jeb to take her into his arms because he missed her as much as she missed him. She watched Jeb head to the house and couldn’t keep up with his fast pace. She watched him walk through the open front door, almost knocking over a late arriving guest. He didn’t even stop to greet him. What happened to his manners? “Did you see Jeb?” someone asked. “Yes, he walked right through the front door a few seconds ago. Didn’t you see him too?” Priscilla asked as she looked through the crowded party to search for Jeb. “No, in fact no one has seen Jeb, Shelby, or their parents tonight,” the other guest said. “Look, there he is. Jeb is so tall; I can easily spot his top hat from here. But what’s the white thing around his neck? It looks like a life jacket,” Priscilla asked. “Wouldn’t surprise me if Jeb decided to take a midnight sail by the Castillo de San Marco. But I don’t see him. Where is he?” Matthew asked. “Look, he’s right there going out the back door. He’s probably headed towards his boat. It’s docked at the rear of the property,” Priscilla said, pointing towards Jeb. “Hey, everyone, Jeb is taking us on a midnight sail in the harbor. Follow the man in a top hat and life preserver and grab bottle of champagne,” Matthew said. “Hurrah!” the party guests cheered in unison as they headed out the back of the house. “Where is he? I don’t see him,” everyone asked. “He’s right there. How can you not see him? Everyone, follow me,” Priscilla said. She led the party outside, and everyone screamed in horror at the sight before them. Four new granite gravestones now occupied the backyard. Priscilla immediately read the engraving on the third marker. She now knew why she never heard from Jeb again. C.M. is currently writing the second novel in the Sisters in Blood series. 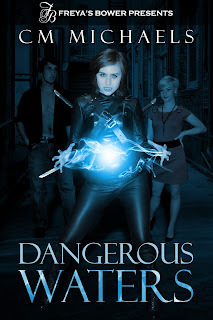 Dangerous Waters, the first book in the series, is in the process of being published by Freya's Bower. When he is not writing, he can be found curled up with a good book, watching movies or hitting the hiking trails with his wife. Please visit my new Blog site at: http://www.cmmichaels.com/index.php/blog-posts/ Thanks! Guest Blog Q&A with Tessa Dawn, Author of Blood Shadows - the latest installment in the Blood Curse series! !